The once-great web colossus is in its final death throes – but how did that happen? 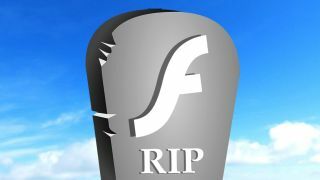 Updated: It's official, Adobe has announced Flash will makes its final exit by 2020. If you've used the internet for longer than a few years then it's more than likely you've come across Flash. Historically, the format has been a pervasive force on the web and, without the smartphone, likely still would have been today. Many people associate Flash, which is actually a platform for a variety of multimedia, with Adobe, but its origins extend far back into the 1990s and a company called FutureWave Software, which made SmartSketch. The software was primarily used for vector drawing applications on Windows or OS X but it never caught on. FutureWave was then acquired by Macromedia, the conglomerate behind many well-known productivity programs among other things. The FutureSplash Animator, a core part of SmartSketch, was rebranded as Macromedia Flash 1.0, which was comprised of two parts: a graphics and animation editor, and a media player. The software grew in popularity between 1996 and 2005 and was thought to have been installed on more computers than all other media players – including Java, RealNetworks, QuickTime, and Windows Media Player – combined. This growth was spurred by aggressive investment in improving Flash services by Macromedia, including adding MovieClips among other features. Over the years, the platform morphed from a media creation tool to a web platform, which is how most people think of it today. In 2005, the year that Flash really came into its own, Adobe acquired Macromedia and incorporated Flash, Dreamweaver, Director/Shockwave, and Authorware. Some of these programs, especially Dreamweaver, are now relied upon in the professional community. Over the years, Adobe continued to develop Flash, which had become a suite of applications, into a web-based platform for video, music, gaming, and much more. Many computers came pre-installed with Flash so that the web would be accessible to them. But in 2007, the world of Flash would be rocked – even if Adobe didn't realise it at the time. Steve Jobs, the CEO of Apple, stood on stage in June 2007 and introduced the iPhone, a device he said would act as a phone, a media player, and, most importantly, an internet browser. This last capability would catapult the iPhone, especially the 3G and 3GS, into the hands of millions of users. Unlike the first versions of Android or Windows Mobile (and later Windows Phone), iPhone OS (which later became iOS) did not support Flash. "I wanted to jot down some of our thoughts on Adobe's Flash products so that customers and critics may better understand why we do not allow Flash on iPhones, iPods and iPads," Jobs later wrote in an infamous memo called 'Thoughts on Flash' which was written in the spring of 2010 and signaled the death of the platform. Jobs laid out several grievances with Flash, including its proprietary nature, the fact that most websites (even then) were switching to other formats for video, the negative effect on battery life, and the poor security record of Flash. "New open standards created in the mobile era, such as HTML5, will win on mobile devices (and PCs too)," Jobs concluded. "Perhaps Adobe should focus more on creating great HTML5 tools for the future, and less on criticising Apple for leaving the past behind." These words, read today, are still relevant and help explain the shortcomings of the Flash platform that have plagued it for many years, exposing users to security risks and dramatically reducing the performance and battery life of phones, tablets, and PCs.